2008 Against the Spread: 9-5. Overview: Nick Saban's rebuilding project at Alabama jumped a year ahead of schedule when the Crimson Tide stunned most college football observes by reaching a BCS bowl game and coming up just short of a bid in the national title game. Whether this was a good thing for the program remains to be seen. Alabama was an afterthought for most fans making their college football picks last fall, as most saw the Tide as a middle-tier team in the rugged SEC. But Saban proved why he was worth the huge paycheck Alabama lured him from the NFL, and he led the team to a season in which it was undefeated for most of the way before losing to eventual national champion Florida in the SEC title game. The Tide benefited from an experienced offensive line and quarterback in John Parker Wilson, who went from three-year work in progress to finally showing the skills and leadership for which the program recruited him. The veteran core was combined with a talented and highly-touted recruiting class at the skill positions that made the Crimson Tide more dangerous on offense than Crimson Tide were used to in the last several years. Saban quickly crafted the club into a physical, fundamentally sound football team that announced its arrival with a blowout win over ACC favorite Clemson in the first week of the season. The Tide would roll through the SEC before its loss to Florida and disappointing upset loss to Utah in its bowl game. Despite the loss of Wilson and offensive lineman Andre Smith to the NFL, the Tide's lineup returns largely intact. This includes explosive playmakers in receiver Julio Jones and running back Mark Ingram on offense, and a defense that returns nine starters. The bad news for the Tide is that they won't sneak up on anyone this year; Alabama is a consensus Top 5 team in the pre-season national rankings, and the Tide will have to deal with the expectations that come with success. The good news for Alabama is that it has the talent, leadership and coaching to fulfill its promise. What's more, as SEC schedules go, the Tide's appears to be manageable, although there are no guaranteed wins on any given Saturday in the nation's toughest conference. Still, Saban has a reputation for thriving on pressure; you can expect that his team will follow his lead and have another big season. 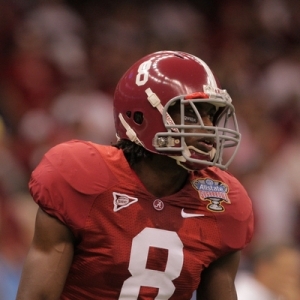 2009-10 Alabama Crimson Tide Football Predictions: 12-2, BCS Bowl game appearance.